Should Ad Networks Pay Publishers For Stolen Content? The Fair Syndication Consortium Thinks So. As newspapers and other publishers watch their revenues diminish, one common refrain among them is that maybe they should somehow go after Google or Yahoo for aiding and abetting the destruction of their businesses and sometimes the wholesale theft of their content. We’ve seen how the Associated Press wants to handle this: by aggressively going after anyone who even borrows a headline. Today, a consortium of other publishers including Reuters, the Magazine Publishers of America, and Politico are taking a more measured approach, but one which will no doubt still be controversial. They are forming the Fair Syndication Consortium, which is the brainchild of Attributor, the startup which tracks the reuse of text and images across the Web for many of these same publishers. The Fair Syndication Consortium is initially trying to address a legitimate problem on the Web: the proliferation of splogs (spam blogs) and other sites which do nothing more than republish the entire feed of news sites and blogs, often without attribution or links. There are tens of thousands of these sites, perhaps more. Rather than go after these sites one at a time, the Fair Syndication Consortium wants to negotiate directly with the ad networks which serve ads on these sites: DoubleClick, Google’s AdSense, and Yahoo primarily. For any post or page which takes a full copy of a publisher’s work, the Fair Syndication Consortium thinks the ad networks should pay a portion of the ad revenues being generated by those sites. I know a little bit about this because in January I was invited to a meeting at the A.P.’s headquarters with about two dozen other publishers, most of them from the print world, to discuss the formation of the consortium. TechCrunch has not joined at this time. Ironically, neither has the A.P., which has apparently decided to go its own way and fight the encroachments of the Web more aggressively (although, to my knowledge, it still uses Attributor’s technology). But at that meeting, which was organized by Attributor, a couple slides were shown that really brought home the point to everyone in the room. 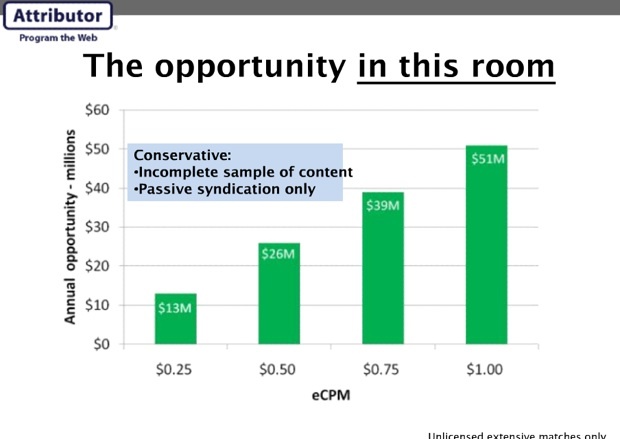 One showed a series of bar graphs estimating how much ad revenues splogs were making simply from the feeds of everyone in the room. (Note that this was just for sites taking extensive copies of articles, not simply quoting). The numbers ranged from $13 million (assuming a $.25 effective CPM) to $51 million (assuming a $1.00 eCPM). Then they put up a slide with a pie chart showing which ad networks were serving ads on all of the abusive sites. It turns out a full 94 percent of the sites in question were serving ads from three ad networks: DoubleClick (45 percent), Google AdSense (24 percent), and Yahoo (24 percent). Go after those three ad networks, and the majority of the problem could be solved. There is certainly precedent for this type of approach. Look at YouTube’s Content ID program, which splits revenues between YouTube and the media companies whose videos are being reused online. Except this proposal would take money that would otherwise be distributed to the splog sites themselves, and give a portion of it to the publisher as an automatic syndication fee without the consent of the site owner. How would the ad networks know that the content in question belongs to the publisher? Attributor would keep track of it all and manage the requests for payment. The consortium is open to any publisher to join, including bloggers. (Attributor runs a free version of its service called FairShare to give publishers a sense of how much of their stuff is being copied without attribution). It is certainly better than sending out thousands of takedown notices, but many issues still need to be worked out. I’ve seen some of the data for TechCrunch, and there is no doubt that Attributor catches a lot of abuse, not fair use. But some of the sites that fall within Attributors net might still fall within fair use. For instance, I can imagine, a short post two or three paragraphs long being copied in its entirety and being surrounded by commentary. (Although, a minimum 125-word-count limit and exclusion of content clearly in quotes is meant to address such a scenario). Also, I am not sure that demanding payment is the way to go. For the most part, a link and attribution is good enough for us. But if the Fair Syndication consortium gets the ad networks on board and they take a conservative approach to asserting copyright, we might take another look. What do you think, should we join?